The breath is our link between body and mind. It is the mind that we are really concerned with in yoga. For it is the mind, in its unconscious and unskilful habits, that is at the root of all our dissatisfactions. But the activity or our minds is too elusive, habitual and subtle for most of us to work with directly. So then we must instead use the external structure of our mind: the body. The body is nothing other than a physical expression of our inner being. All of our fears, hopes, memories and dreams can be read in the structure and activity of our bodies. The activity of the body which most directly and fluidly expresses the mind is the breath. We have all been told in times of stress to breathe deeply. The quality of our breathing and what we do with it are completely bound up with our state of mind. To transform our state of mind, the most simple and direct means is not to attempt to change our breathing by releasing tension from respiratory muscles and those that support them. The bandhas even more directly transform our breathing, and thereby the quality of the mind. But perhaps the most simple and accessible way of transforming the quality of the mind is by synchronizing the movement of the body with our breathing. This does not depend on large thoracic capacity, on flexibility, strength, refined respiratory control: it depends on attentiveness. Of course our contemporary culture fosters inattentiveness, but attentiveness is inherent. It is a function of interest. If we are interested in something we have to make no effort to attend to it. If we are only interested in its result, this is not so. Moving the body can be a fascinating experience. Simply walking with attention can be a revelation. Walking in time with the breath even more so. Continued practice of Yoga presupposes a capacity to be intrigued by the body, its movement and its capability. Those who start to do yoga because they think it will be good for them, and take no pleasure, intrigue or satisfaction from the doing of it soon give up. To move our body in time with our breathing requires presence of mind. This is the power of breath-body synchronization. It immediately harnesses our mind. It brings us straight into the present moment, freeing us from regret and anxiety, from fear and doubt, from hope and ambition. Even if we are unable to bring about exact synchronization this occurs. The mental effort required in attempting to bring it about precludes the possibility of any other mental activity occurring. Breath-body synchronization immediately triggers the meditative mind: a mind present to the actuality of the moment, a mind not fragmented by past and future, this and that. The synchronization of movement with the breath is fundamental to classical yoga practice. It is known as vinyasa. Vinyasa has many implications but the key one is that breath and body become one in their movements. Vinyasa is used in yoga practice in a number of ways. First it is used as the basis of the sun salutations used to prepare the mind, body and breath for the yoga posture to work. It is also used in the form of breath linked movements in between postures. Last, but not least, it is used to determine entry into and exit from individual postures. The presence of vinyasa is the hallmark of classical yoga practice. Its power depends to a great extent upon it, as does its beauty. The key element of vinyasa is that any movement coincides exactly with either an inhalation or exhalation. This coincidence is total. 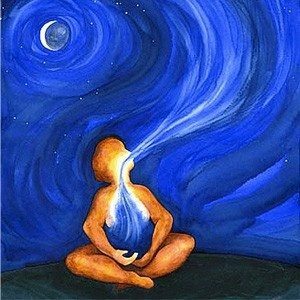 The beginning of the inhale (or exhale) is also the beginning of the movement. The end of the inhale (or exhale) is the end of the movement. This is the basic context of Breath-body synchronization. But it can be refined further than this. The speed of the body’s movement also coincides exactly with the speed of the breath. A free inhalation and exhalation usually have a regular cycle. They begin picking up a little speed, then coast for most of their duration at a constant speed, and then slow down towards the end. The exact nature and tempo of this cycle depends on the muscular and respirator capacity. Allowing the body to follow this tempo as closely as possible is an important, subtle aspect of vinyasa. The more refined this synchronization, the more focused, alert and internalized the mind becomes. Vinyasa practice at this level triggers, through the rhythmic activity of the breath (pranayama), the profound meditative internalization known as pratyahara, the fifth limb of classical ashtanga yoga practice. Pratyahara the leads, with practice, directly to meditation.